Kickoff your April weekend with the alluring duo – Kim Lee and Kat Nova, collectively known as DJ KimKat at PLAY club at The Roof. With a collective talent for recognizing exciting melodies, the multi-talented women began pursuing their dream of being internationally recognized DJ’s. Since 2007, DJ KimKat connected over their mutual aspirations and have quickly become a highly sought act in the DJ commodity. 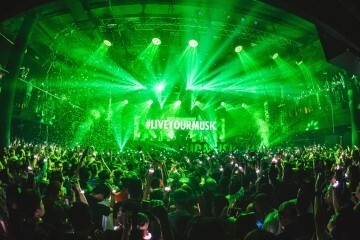 The Los Angeles natives have toured across the United States from Scottsdale to New York and internationally from Korea to Vietnam, captivating crowds with their unique electro sets. Expertly infusing EDM, Hip-Hop, Trance, and Top 40, DJ KimKat grace any venue that they play at with unrivaled energy and compelling music selection. Their stylish visual aesthetic brings another tantalizing component to an already enviable presentation. The dynamic duo is currently working on their debut album, and is prepared to prove that they can create their own music capable of fascinating the masses. Enter your email address to subscribe to ConcertKaki's new posts by email. © 2018 ConcertKaki. All Rights Reserved.